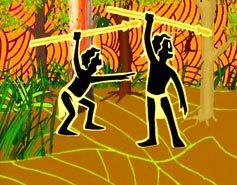 The Dreaming is an award winning animation series recommended by educational institutions throughout Australia and is widely used as a teaching resource for across the curriculum studies in schools and learning institutions in each State & Territory for years 1-10. 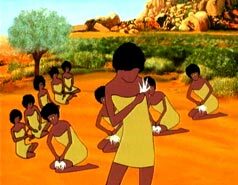 These animated films are based on Australian Aboriginal storytelling (oral histories) that have been maintained as a body of knowledge for over 40,000 years. There are 6 parts to the complete series, and each looks at unique indigenous stories, beautifully animated by Aboriginal and Torres Strait Islander artists. Children love them and adults are amazed at what they learn about Australia from each story. Order today and get all six series plus accompanying teacher's guides. Now only $440 - including postage & G.S.T. 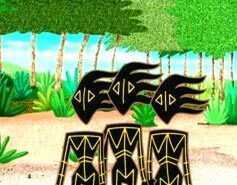 There are 6 parts to the complete series, and each looks at unique indigenous stories, beautifully animated by Aboriginal and Torres Strait Islander artists. Total duration of the 6 DVDs is 18.5 hours! See episode list. Including special behind the scenes featurettes and mini-documentaries on the storytellers and their communities. 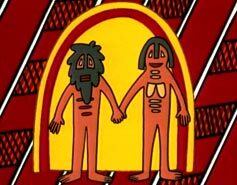 The Dreaming stories are sourced from indigenous communities across Australia, revealing for the first time the cultural spread and diversity of Indigenous Australia, as illustrated by these unique animated oral histories. Teacher's Guides in PDF format for each series. Includes map images locating each story, text of each story, backgrounds on the storytellers, suggested teaching strategies and full lists of the participating communities. The Dreaming has won multiple awards and accolades, and has even been commemorated by a special First Day edition of Australian Postage Stamps. As told by Henry Rankine O.A.M. 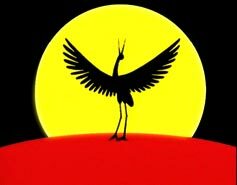 Please note: This video may contain the names, voices and faces of people who are now deceased, which may cause distress to Aboriginal and Torres Strait Islander viewers. We ask that you please use care when viewing and navigating this material. The Dreaming is sometimes referred to as The Dreamtime. 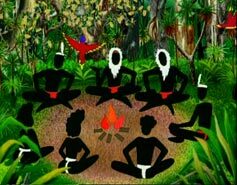 Today Aboriginal storytellers prefer to use The Dreaming as a way of describing their stories and their oral history because The Dreaming in Aboriginal culture is not considered something that occurred in the past, it is continually occurring and is ever-present in their culture. 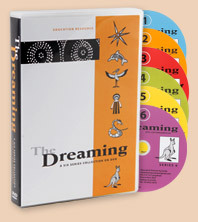 The Dreamtime "was", The Dreaming "is". That the stories are recognised as a �body of knowledge� that is many thousands of years old. That the stories are sourced from the communities who own them. That the communities make their own decision on what stories they want to have animated. That the communities approve the story for animation. That the story represents the community and clan and is specifically placed geographically. Ownership and copyright of the story is always held by the nominated community council. 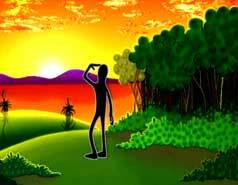 That the content of the animation including artist�s style be approved by the community at all key production stages. That the story provided by the community is not rewritten or changed unless approved and endorsed by the community. That the community be paid industry standard rates and receive royalties from revenues. 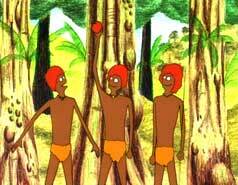 That Indigenous people design and participate in the creation of the animation at all stages of production. 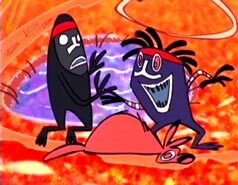 Aboriginal Nations Australia was established as an independent animation company with the objective to employ and train Aboriginal artists as animators to produce a series of Dreaming stories selected from different Aboriginal communities across Australia. The stories were sourced from many communities, and permission to tell them and animate them obtained from community Elders & community Councils. During this process, Aboriginal Nations developed a cultural protocol to ensure that the copyright for each story was identified and retained by the communities providing the stories. Click here to see the ten point list. This cultural protocol was endorsed by the NSW Aboriginal Education Consultative Group (AECG) Inc. and World Indigenous Peoples Conference: Education (1996). The UNICEF Film and Television Office and ASIFA, the International Animation Industry Association, have also supported the protocol. 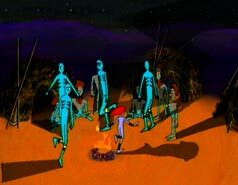 To produce this series a team of Aboriginal artists were trained in the techniques of traditional and computer assisted animation. Each story was then researched in-depth so that the animators could accurately portray the cultural content of the story. One important consideration was to look at the art produced from the area and to use this art as a basis to develop the style and the uniqueness of each story. 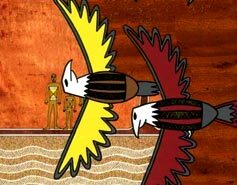 The series provides an insight into The Dreaming which has different meanings for different Aboriginal groups. The Dreaming can be seen as the embodiment of Aboriginal creation which gives meaning to everything: the essence of Aboriginal belief about creation, spiritual and physical existence. It establishes the rules governing relations between the people, the land and all things for Aboriginal people. Royalties are paid from sales to the storytellers and their communities. Special First Day edition of Australian Postage Stamps issued by Australia Post featuring a selection of The Dreaming images from the animation series. Completion of 79 animated episodes of The Dreaming stories. Best Animated Film & City of Gava Best Film Award (all categories) for the story of The Dolphin. 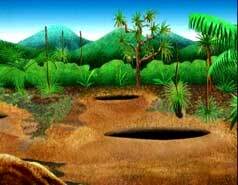 Aboriginal Nations Australia Pty Limited. ABN 78 087 139 106. EQ/FSA Building 17, 210 Driver Avenue, Moorepark 2021, Sydney, NSW, Australia.